This coming week, Seth will be on Naked Science on the National Geographic channel. The episode is called "Hunt for Aliens" and features NASA scientists, planet hunters, and astronomers discussing emerging methods of finding Earthlike planets and alien life and possible future techniques, including fiber-optic probing and interstellar travel powered by light at warp speeds. Also, an inside look at the Allen Telescope Array. Airtimes are Thursday, April 1 at 8pm, Sunday April 4 at 7am, Thursday April 8 at 7am and Sunday April 11 at 11pm. Part 1 of SETI: Now What?, a look at what prompted the need to search for extra terrestrial intelligence 50 years ago. Part 2 of SETI: Now What?, featuring Frank Drake, Director of the Carl Sagan Center for the Study of Life in the Universe, SETI Institute. Part 3 of SETI: Now What?, featuring Jill Tarter, Director of the Center for SETI Research, SETI Institute, and Tom Pierson, CEO, SETI Institute, discussing how the SETI Institute began, the book and film Contact, and the "Wow!" Signal. Part 4 of SETI: Now What?, featuring the tale of how one U.S. Senator ended SETI's funding from NASA. Part 5 of SETI: Now What?, featuring Ben Zuckerman, physicist, astronomer, UCLA, on why SETI may be a waste of time. Part 6 of SETI: Now What?, featuring Dan Werthimer, Chief Scientist, SETI@home, University of California, Berkeley. Part 7 of SETI: Now What?, featuring Paul Horowitz, physicist, electrical engineer, Harvard University, discussing optical SETI, as well as a description of the launch of the Allen Telescope Array. Part 1 of Thanks for the Memories, featuring a short term memory test on our intern, Sandra Chung, and volunteer Jay Weiler. Part 2 of Thanks for the Memories, featuring Adam Gazzaley, director of the Neuroscience Imaging Center at University of California, San Francisco. Part 3 of Thanks for the Memories, featuring Gordon Bell, principal researcher at Microsoft Research, and Jim Gemmell, senior researcher at Microsoft Research. Part 4 of Thanks for the Memories, featuring James McGaugh, neurobiologist at the University of California, Irvine. Part 5 of Thanks for the Memories, featuring Viktor Mayer-Schönberger , director of the Information and Innovation Policy Research Center at the National University of Singapore’s Lee Kuan Yew School of Public Policy, and the author of Delete: The Virtue of Forgetting in the Digital Age. Part 6 of Thanks for the Memories, featuring Todd Sacktor, neurologist, SUNY Downstate Medical Center. Part 1 of Physics Phrontiers, featuring Anil Ananthaswamy, corresponding editor for New Scientist magazine in London and author of The Edge of Physics: A Journey to Earth’s Extremes to Unlock the Secrets of the Universe. Part 2 of Physics Phrontiers, featuring André de Gouvêa, associate professor of physics, Northwestern University. Part 3 of Physics Phrontiers, featuring Steven Weinberg, Nobel Prize-winning physicist at University of Texas at Austin and author of Lake Views: This World and the Universe. Part 4 of Physics Phrontiers, wherein Seth visits a local hydroponics shop which sells jugs of dark energy as botanical growing supplements. Part 5 of Physics Phrontiers, featuring Anil Ananthaswamy, corresponding editor for New Scientist magazine in London and author of The Edge of Physics: A Journey to Earth’s Extremes to Unlock the Secrets of the Universe. Part 6 of Physics Phrontiers, featuring Anil Ananthaswamy, corresponding editor for New Scientist magazine in London and author of The Edge of Physics: A Journey to Earth’s Extremes to Unlock the Secrets of the Universe. Part 7 of Physics Phrontiers, featuring Leonard Susskind, professor of theoretical physics, Stanford University. Part 1 of Skeptic Check: Climate Clamor featuring climate scientist Stephen Schneider, discussing how climate science works, how it doesn't, and how arguments regarding anomalous storms and a context-free quotes from emails stem from intellectual bankruptcy. Part 2 of Skeptic Check: Climate Clamor featuring Phil Chapman, Apollo 14 Mission Scientist, now a geophysicist and consultant on energy and astronautics. Part 3 of Skeptic Check: Climate Clamor featuring Stephen Schneider, Climate scientist, Stanford University, discussing the misinformation consumed and spread by climate change denialists. Part 5 of Skeptic Check: Climate Clamor featuring Naomi Oreskes, Professor of History at the University of California, San Diego and author of Merchants of Doubt: How a Handful of Scientists Obscured the Truth on Issues from Tobacco Smoke to Global Warming. Here's a quick one minute video demonstrating the slime power of the hagfish. The animal is anesthetized, given a small pulse of electrical current, and when the tiny bit of slime extracted from it is put into a glass of water, well... You've Been Slimed! Hagfish aren't really fish, as they have no jaw. In fact, they're the only animal that has a skull and no vertebral column. Their slime is believed to be used primarily as an escape mechanism. They secrete it when captured, but it is also believed that they use it as a lubricant to free themselves from the carcasses on which they feed. The slime also acts to clog up the gills of predator fish, and so the hagfish has developed a peculiar way of keeping its own gills free of slime. When agitated, the hagfish secretes enough slime to turn a 20 liter bucket of water into pure slime in a matter of minutes. To clear itself of this immense amount of slime, the hagfish ties itself into a knot, which then travels the length of its body, thereby wringing out the slime, and likely freeing it from its captor. 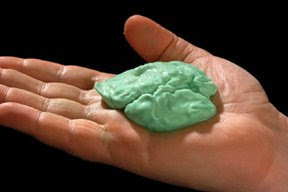 In this week's show, Seth & Molly make slime in the SETI kitchen with guest Tori Hoeler. Here's how: Fill one cup with water and add a spoonful of the Borax powder and stir it up. Fill another cup with about 1/2 inch of glue. Add three tablespoons of water to the glue and stir. Add a few drops of food coloring and stir again. Add two tablespoons of the Borax solution and stir well and voila! You've been slimed! Of course, for the above photo, I'm the one forced to pose with the slime. It was kind of slick, viscous, sticky. I wish there were a single word to use to describe it. Blimey! I'm stymied. Part 1 of You've Been Slimed! featuring Tori Hoeler, Astrobiologist, NASA Ames Research Center. Part 2 of You've Been Slimed! featuring Douglas Fudge, Biologist, University of Guelph, Canada. Part 3 of You've Been Slimed! featuring John Tyler Bonner, Professor Emeritus of Ecology and Evolutionary Biology, Princeton University, and author of The Social Amoebae: The Biology of Cellular Slime Molds. Part 4 of You've Been Slimed! featuring Chris Phoenix, Director of Research, Center for Responsible Technology. Part 5 of You've Been Slimed! featuring Andre Bormanis, television writer and producer, discussing the film The Blob. Note: In this segment, seth laments that this film was never remade, but a listener pointed out that there was a remake in 1988 and we've since learned that another is planned for 2011.